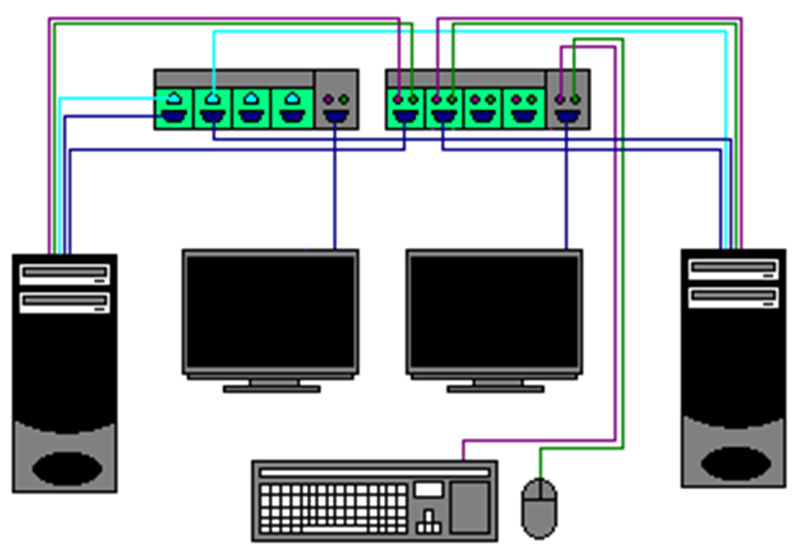 A Keyboard/Video/Mouse(KVM) switch lets you use the same keyboard, mouse and monitor to control multiple computers. This helps you save desk space and money as you can use the same peripherals to control and view each of the computers you connect. 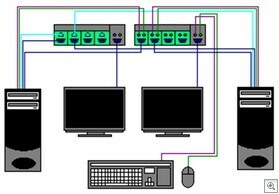 If you have a dual screen setup, and you would like to connect multiple computers up to your monitors, people will tell you to spend a large amount of money to get a KVM switch which will handle this. 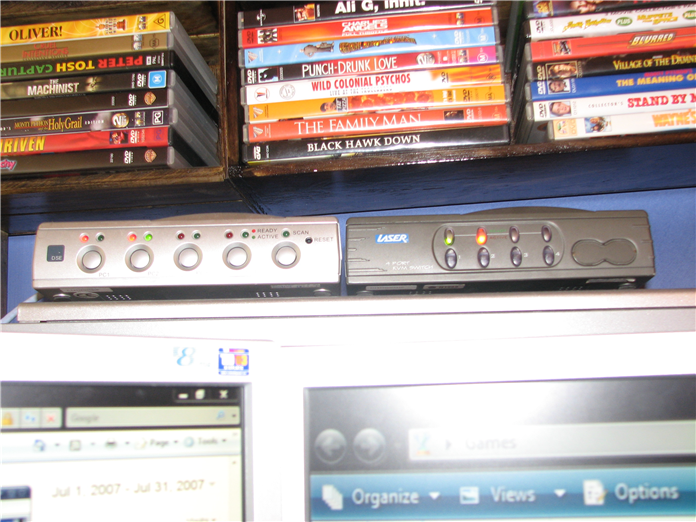 For a dual screen KVM switch which you can connect 4 computers, you are looking at spending around $500 and you are also likely to have to spend additional money on the cables, and these can cost more than the switch itself. It is almost worth purchasing extra monitors and peripherals to control your computers, instead of buying one of the really fancy switches. Switching can no longer be done through the keyboard (still works for one screen). To switch computers, you will need to press two buttons instead of one. Instead of spending $500 on a dual monitor KVM switch, I bought two single monitor KVM switches for $100 each. Another bonus is that four port, single monitor KVM switches often include the cables meaning you do not have to purchase them separately. They are available in USB and PS/2 variations, with both costing similar amounts. From a major electronics retailer, I purchased a 4 port PS/2 KVM switch and a USB KVM switch for $AU100 each and they both came with all the cables I needed. If you look around online or in smaller computer shops, you can probably get them for much cheaper. The point is, you can get the same results for less than $200 as opposed to the $500 do-it-all KVM switch. I am currently running a Windows XP computer and a Windows Vista computer. I am using one wireless keyboard and one wireless mouse, each with their own receiver. Both of the computers output their display to the same two monitors. I switch between the computers by pressing 2 buttons. I sometimes have computers that I am fixing attached to the KVM switch also, allowing me to do all my work in the one place. In my case, the KVM switches do not have their own power source. They are supplied power through either the USB or the PS/2 ports. I was disappointed when I bought my USB KVM switch to find that it had PS/2 connectors for the mouse and keyboard inputs, and USB was only used for the connection to the computers. I have connected one monitor, keyboard and mouse to the PS/2 KVM switch. 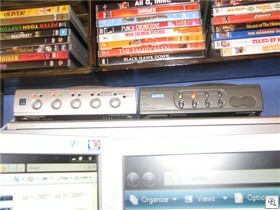 Only a monitor and USB connections are connected to the USB KVM switch making it solely a monitor switcher. A picture says a thousand words. As you can see, drawing is not my strong point, but this picture does show the connections that need to be made. Luckily, KVM cables contain either Video and USB connections or Video and PS/2 connections. Some also contain audio cables. Either way, there are a fair few cables involved for any KVM setup. The USB KVM switch would not allow for me to enter the BIOS on machine startup as the computers did not recognise the keyboard at this stage of the boot up. Once I was in Windows, everything worked fine for me. That is why I used the PS/2 KVM for keyboard and mouse input. You are able to use two USB KVM switches only, but you may come across the same problem. It may have been something to do with the keyboard I was using. With this setup, pressing “PC 1” on both KVM switches will bring up Windows XP, and “PC 2” on both KVM switches will bring up Windows Vista. If you are very handy and technically savvy, there is no reason why you could not build your own box to store both KVM switches, and even re-wire them so you only need to press one button. This is too complicated for me to try but it is bound to be possible. I prefer pressing the two buttons because I know it works. If you have any questions about this article, please post your query in the comments section, and you should receive a response within two days. I hope that you have found this article useful. Please stick around and check out some of the other tips at Inspect My Gadget. How-to: Split your video signal to multiple monitors. Why not just remote into the second computer? It’s no good for playing games, watching movies and a bunch of other stuff. This way you get to use the full power of both computers. Just wondering if you could help. I’m trying to connect a Ritmo USB KVM 2 port switch but I don’t think it’s working as it should. so I can connect it properly. Hi Andrew, Is there not a wiring diagram in the manual? What part of it is not working? Drawing a diagram is a bit complicated, especially seeing that I am not aware of the specifics of the device. If it is mostly working, it is best to fault find the rest. Please give a few specifics and I will see what I can do. I can’t seem to find a kvm switch that works with duel monitor/duel computer and also extending desktop on both monitors. This does work with extended desktop, but yet again, there are two buttons to press(or keyboard shortcuts) to get it working. Both computers have 2 video ports. To move windows from computer a to b, try using synergy, in conjunction with this setup. I have had little luck with it but most sites I read say its the beezneez. I have one computer with dvi/ps2 and another with dvi/usb. I currently have a 2 port vga/ps2 KVM and can only share one monitor and neither the keyboard or mouse. I have been looking into a 2 port dvi/usb KVM and I think this will allow me to share my cordless usb mouse, ps2 keyboard and dual monitors (one is vga only, the other has both vga and dvi). Do you think it will work? The only thing about your diagram I don’t understand is the light blue lines that I assume are usb. What is that for? Is it simply sharing other connected usb devices? The KVM I’ve been looking at also only has one usb connector for each attached PC. I assume that handles both keyboard and mouse? Thanks for any advice. The lgiht blue is the USB. This is used to transport the keyboard and mouse signals to the computers. Cordless keyboards and mice should work as well as corded devices. From the computers point of view, it is the same thing. As for the monitors, you may need to use some DVI to VGa converters. They are cheap <$5. You won’t get the benefits of DVI, but there isn’t too much of a diference for most things. Brilliant article! You’re a very smart guy! Don’t let others ever discredit your ideas! I’ve decided to buy two CAD$8 2-port KVM switches from eBay. I’ll connect one (with one monitor) as it is supposed to be, the other one with external power and just the monitor-2 ports. This will require pressing the “switch-pc” button on both KVM switches together to do the switch, but I save over $100 by not buying a dual-monitor KVM switch!! !